It’s time for another post in my solo travel series! This past week I helped out at the school full time again, left my Workwaway host, checked myself into a awesome hostel in Ao Nang and spent the weekend with a surprise guest; my dad! Overall, it was a great week. Just like last week, the work at the school was draining but rewarding. After barely two weeks I felt like I really knew the kids, and I was a bit sad to leave them. Besides working at the school I didn’t do too much; I visited the local market twice more and took some walks around the neighbourhood. I’ll be a doing a post soon all about my Workway experience, so keep an eye out for that! On Saturday morning I packed my stuff and left my Workwaway host for a hostel in Ao Nang; a very awesome hostel. I’ve stayed in plenty of hostels the past few years, and this one is by far my favourite. It has everything you need and more (including free unlimited bananas in the morning! ), is super stylish and all for a great price. 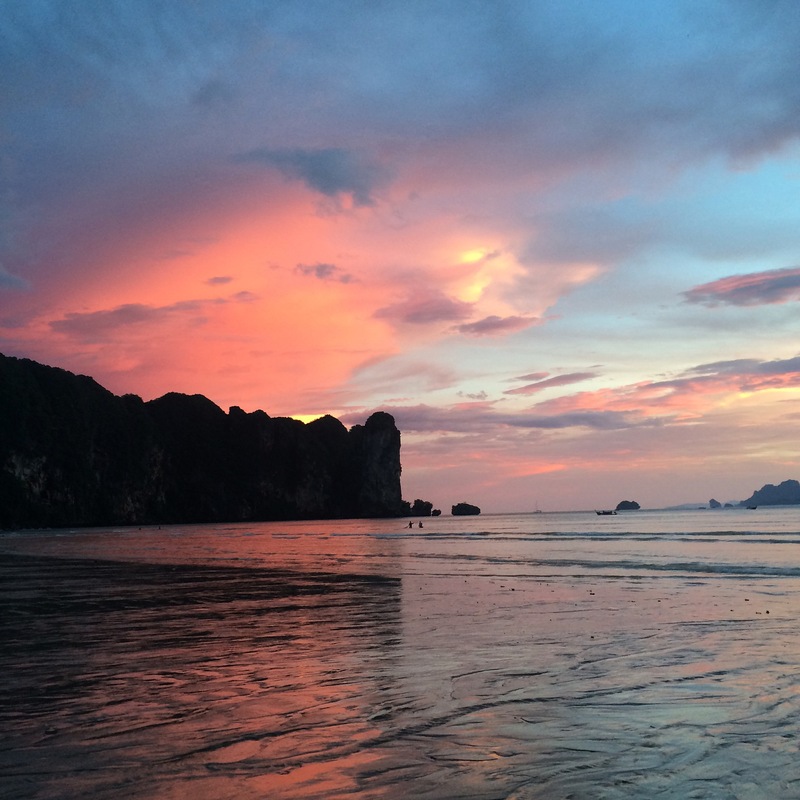 If you’re ever in Ao Nang, I 100% recommend staying at Glur Hostel. 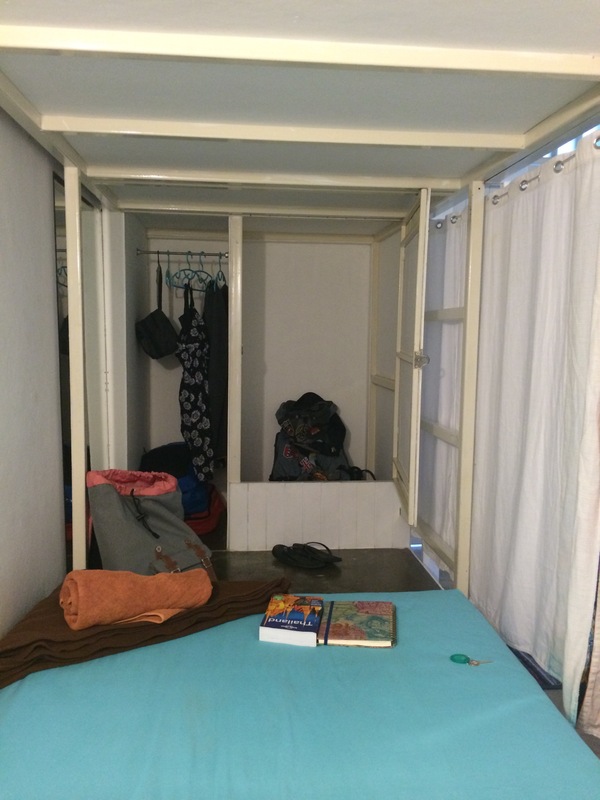 My little “room” in the hostel, which is actually a bunk bed! It comes with a little closet, a storage space which can be locked, a mirror, towels and bedding, and a curtain for privacy! After dropping off my stuff I went to meet my dad, so surreal! A few days before I got a message from him saying that he could fly over to Krabi in between business trips and spend the weekend here, and I couldn’t have been more excited. As much as I’m enjoying this solo travel expereince, I’d be lying if I said I’m never homesick. Spending the weekend with my dad made me so happy and also gave me the confidence I need to continue this trip. We spent Saturday at Ao Nang and Sunday ventured to Chicken Island via longboat, which may be my new favourite destination here. There was barely anyone else on the island, the water was crystal clear, and there were beach swings everywhere. Doesn’t that sound like paradise? I was so genuinely happy that day; immersed in nature with one of the people I care about most in this world. I’m currently sitting in my little “room” at the hostel writing this, not yet halfway through my “beach bum” week here in Ao Nang. I’ll be writing a post all about this week soon!